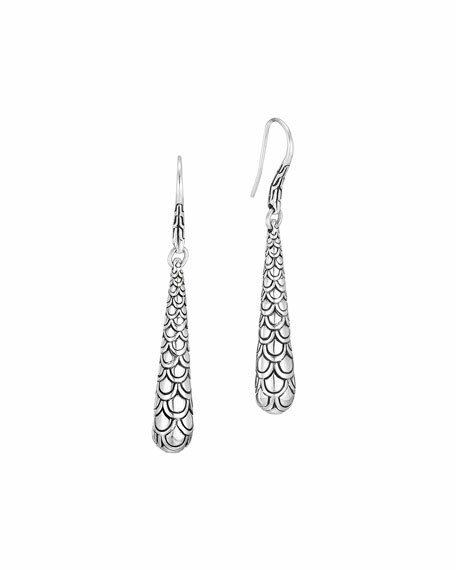 John Hardy earrings from the Naga Collection. French wire backs for pierced ears. Approx. 1 7/8" L x 1/4" W.
Artisan-crafted in Bali since 1975. Through powerful design, dramatic detail and inspiring meaning, John Hardy jewelry collections represent the pinnacle of craftsmanship and quality. From our Legends Collection, the Naga was inspired by the mythical water dragon that protects the ocean's pearl. Wear facing inward to be bestowed with love and abundance, or outward for protection. Auden "Bronson" climber earrings. Brass hardware. Swarovski?? simulated pearls and crystals. Surgical steel post backs with top clip. Approx. 3"L x 0.5"W. For pierced ears. Ben-Amun crystal earrings with pearly teardrop. Polished silvertone plated pewter hardware. Tiered clear glass crystal form fan motif. Single pearly glass teardrop dangle. Post backs for pierced ears. Made in USA. Hanna earrings by Dylanlex in oxidized silver plating. Kite-shaped studs with multi-strand chain dangles. Round, pearly white beads at posts and chains. Post backs for pierced ears. Handmade in New York, USA. Monarch marquis fishtail earrings by Fallon. Polished rose golden brass hardware. Hand-set clear cubic zirconia. Post backs for pierced ears. Monarch marquis fishtail earrings by Fallon. Polished rose golden brass hardware. Hand-set clear cubic zirconia. Post backs for pierced ears. Approx. 2.5"L.